Beautiful capture of the fox, Misty! He is a pretty one! Thanks for hosting and have a great weekend! He is a beauty - very healthy. Gorgeous fox. I love the colour and the bushy tail. OH, how gorgeous. A fox! Great photo, Misty. You must have your camera right up to your eye all day! I have seldom seen foxes, and this one's a beauty. Thanks! Good eye to find and photograph this elusive critter. Well done. Is this fox running around your back yard? Great photo of it! Fox are such beautiful creatures. Wonderful shot. 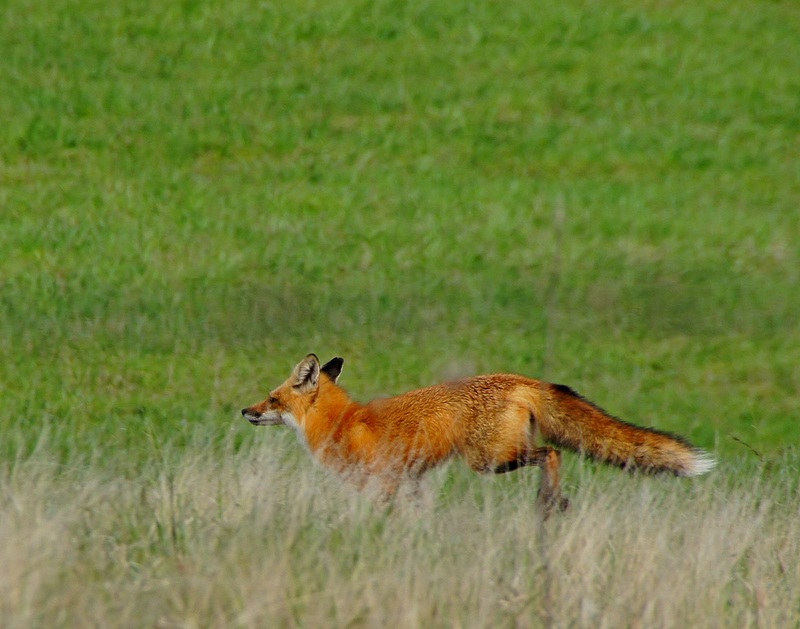 Fantastic photo of the Fox on the Run,.....wasn't that a song? I think it was. Check it out. http://www.youtube.com/watch?v=oLLHb7dAKmo. Wonderful, thick bushy tail on this fox! A great photo! Beautiful! And healthy too. That's always good. For me it is always exciting to see a fox. I see them so rarely. Great photo! Excuse Me Have You Seen My Tail Feathers?